At BRIO, food and celebration go hand-in-hand. Our Chefs have hand selected a variety of their Italian favorites from which to choose. 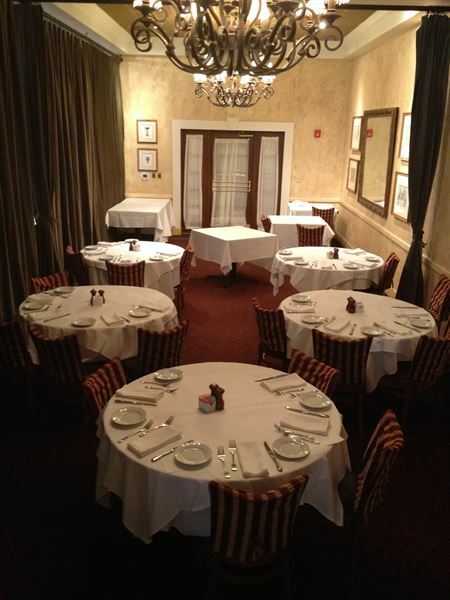 Our two beautiful private dining rooms can seat up to 48 guests. We look forward to creating a memorable event for you and your guests! Plated dinner menu options include: Cena A ($25.95 per person) - Choice of One Soup or Salad - Choice of One Pasta - Choice of One Chef's Select Entrée Cena B ($28.95 per person) - Choice of One Soup or Salad - Choice of One Pasta - Choice of One Chef's Select Entrée - Choice of One Grille Entrée Possible Add-ons Include - Spicy Black Pepper Shrimp (Add $5.95 per guest) - Jumbo Lump Crab Cake (Add $7.25 per guest) - Grilled Jumbo Shrimp (Add $5.95 per guest) - Broiled Lobster Tail (Add $9.95 per guest) * Add-on prices only apply to the guests ordering the add-ons Cena C ($33.95 per person) - Choice of One Soup and One Salad - Choice of One Pasta - Choice of One Chef's Select Entrée - Choice of One Grille Entrée Possible Add-ons Include - Spicy Black Pepper Shrimp (Add $5.95 per guest) - Jumbo Lump Crab Cake (Add $7.25 per guest) - Grilled Jumbo Shrimp (Add $5.95 per guest) - Broiled Lobster Tail (Add $9.95 per guest) - Mushroom Marsala Sauce (Add $1.95 per guest) - Gorgonzola Crust (Add $2.50 per guest) * Add-on prices only apply to the guests ordering the add-ons Cena D ($38.95 per person) - Choice of One Soup and One Salad - Choice of One Pasta - Choice of One Chef's Select Entrée - Choice of One Grille Entrée Possible Add-ons Include - Spicy Black Pepper Shrimp (Add $5.95 per guest) - Jumbo Lump Crab Cake (Add $7.25 per guest) - Grilled Jumbo Shrimp (Add $5.95 per guest) - Broiled Lobster Tail (Add $9.95 per guest) - Mushroom Marsala Sauce (Add $1.95 per guest) - Gorgonzola Crust (Add $2.50 per guest) * Add-on prices only apply to the guests ordering the add-ons Please review the attachment for more information on menu selections and private events. Prices do not include service charge and are subject to change. Events scheduled for Friday night, Saturday, and Sunday brunch require a $100 deposit. Plated lunch menus include: Pranzo A ($17.95 per person) Soup & Salad (Choose One) - Zuppa del Giorno - Lobster Bisque (add $1 per guest) - BRIO Caesar Salad - BRIO Chopped Salad - Bistecca Insalata - Kale Caesar (add $1 per guest) Entrees (Select Three - one entree per guest) - Pasta BRIO - Pasta Alla Vodka - Campanelle Carbonara - Fettuccine Alfredo - Strawberry Balsamic Chicken Salad - Kale Caesar Grande Chicken Salad - Grilled Chicken Marsala - Lasagna Bolognese Includes iced tea, coffee, and soft drinks Pranzo B ($19.95 per person) Soup & Salad (Choose Two) - Zuppa del Giorno - Lobster Bisque (add $1 per guest) - BRIO Caesar Salad - BRIO Chopped Salad - Bistecca Insalata - Kale Caesar (add $1 per guest) Entrees (Select Three - one entree per guest) - Pasta BRIO - Pasta Alla Vodka - Campanelle Carbonara - Pasta Pesto - Fettuccine Alfredo - Strawberry Balsamic Chicken Salad - Kale Caesar Grande Salmon Salad - Kale Caesar Grande Chicken Salad - Grilled Chicken Marsala - Grilled Salmon Fresca - Chicken Limone - Chicken Milanese - Lasagna Bolognese Includes iced tea, coffee, and soft drinks Please review the attachment for more information on menu selections and private events. Brio Brunch Plated ($18.95 per person) - BRIO Scrambled Eggs and Bacon - French Toast - Ham and Biscuit Benedict - Chef's Seasonal Omelette - Coffee, Tea & Soft Drinks Brio Brunch Buffet ($20.95 per person) - Continental Breakfast Station - BRIO Style Breakfast Station - Juice, Coffee & Hot Tea Please review the attachment for more information on menu selections and private events. Tuscan style lunch menu options include: Classico ($20.95 per person) Salads (Choose One) - BRIO Chopped Salad - Caesar Salad - Wedge Salad - Kale Caesar (add $1 per person) Pasta Entree (Choose One) - Campanelle Carbonara - Pasta Brio - Fettuccine Alfredo Chef's Select and Grille (Choose One) - Chicken Milanese - Grilled Chicken Marsala - Chicken Limone - Grilled Salmon Fresca - Lasagna Bolognese Sides (Choose One) - Yukon Gold Mashed Potatoes - Crispy Fingerling Potatoes - Roasted Vegetables - Grilled Asparagus - Herb Campanelle Pasta Dessert Dolchinos (Choose One) - Crème Brulee - Tiramisu - Caramel Mascarpone Cheesecake - Seasonal Selection Includes iced tea and soft drinks Ultimo ($22.95 per person) Salads (Choose Two) - BRIO Chopped Salad - Caesar Salad - Wedge Salad - Kale Caesar (add $1 per person) Pasta Entree (Choose One) - Campanelle Carbonara - Pasta a la Vodka - Pasta Brio - Fettuccine Alfredo Chef's Select and Grille (Choose Two) - Chicken Milanese - Grilled Chicken Marsala - Chicken Limone - Grilled Salmon Fresca - Lasagna Bolognese - 6 oz. Filet Mignon ($5 extra per guest) Sides (Choose Two) - Yukon Gold Mashed Potatoes - Crispy Fingerling Potatoes - Roasted Vegetables - Grilled Asparagus - Herb Campanelle Pasta Dessert Dolchinos (Choose One) - Crème Brulee - Tiramisu - Caramel Mascarpone Cheesecake - Seasonal Selection Includes iced tea and soft drinks Please review the attachment for more information on menu selections and private events. Tuscan style dinner menu options include: Classico ($34.95 per person) Salads (Choose One) - BRIO Chopped Salad - Caesar Salad - Wedge Salad - Kale Caesar (Add $1 per guest) Pasta Entree (Choose One) - Pasta BRIO - Pasta a la Vodka - Campanelle Carbonara - Fettuccine Alfredo Chef's Select Entree (Choose One) - Lasagna Bolognese - Chicken Milanese - Grilled Chicken Marsala - Chicken Limone - Jumbo Lump Crab Cakes - Grilled Salmon Fresca - Tuscan Grilled Pork Chops Sides (Choose One) - Yukon Gold Mashed Potatoes - Crispy Fingerling Potatoes - Roasted Vegetables - Grilled Asparagus - Sicilian Cauliflower - Maple Balsamic Brussels Sprouts - Herb Campanelle Pasta Dessert (Choose One) - Crème Brulee - Tiramisu - Seasonal Selection - Caramel Mascarpone Cheesecake Ultimo ($39.95 per person) Salads (Choose Two) - BRIO Chopped Salad - Caesar Salad - Wedge Salad - Kale Caesar (Add $1 per guest) Pasta Entree (Choose One) - Pasta BRIO - Pasta a la Vodka - Campanelle Carbonara - Fettuccine Alfredo Chef's Select Entree (Choose Two) - Lasagna Bolognese - Chicken Milanese - Grilled Chicken Marsala - Chicken Limone - Jumbo Lump Crab Cakes - Grilled Salmon Fresca - Tuscan Grilled Pork Chops - Gorgonzola Crusted Beef Medallions - 6oz Filet Mignon (Add $5 per guest) Sides (Choose Two) - Yukon Gold Mashed Potatoes - Crispy Fingerling Potatoes - Roasted Vegetables - Grilled Asparagus - Sicilian Cauliflower - Maple Balsamic Brussels Sprouts - Herb Campanelle Pasta Dessert (Choose Two; will serve one per guest) - Crème Brulee - Tiramisu - Seasonal Selection - Caramel Mascarpone Cheesecake Please review the attachment for more information on menu selections and private events.